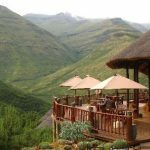 Inspired by Ska Mirriam’s international award winning cookbook, Cuisine of the Mountain Kingdom, this month is all about the queen of lijo tsa Basotho, (Basotho Food), Corn or Maize as it’s called here. We’re just coming into harvest time and the grain stores of most families are slim to none so it’s wonderful to see people now in the fields starting to harvest. While in January and February it was the standard for people to be carrying peaches and usually eating them at the same time, by March it was time for boiled sweet corn. Yum. Picked while the stalks were still green and the kernel were fat, yellow and sweet. As time marched through March the stalks continued to dry out. 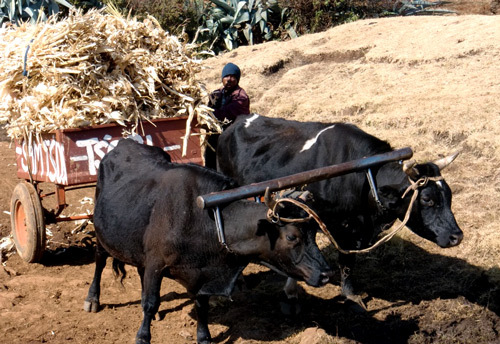 Finally they are cut by hand and brought home so the stalks can be used for animal feed and the hardened maize kernels are separated from the cobs by hand-grinding. The kernels are bagged up or loaded in 20 litre buckets and taken to a local mill for grinding into flour, called maize meal or mealie meal and stored in 50kg grain sacks in people’s homes. Most people in our area also save a large number of kernel as seed for the next planting season. 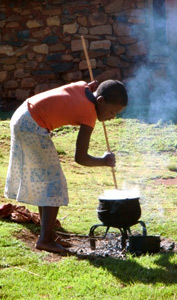 When the maize meal is cooked with water in a pot, usually over a wood fire, is transforms into a dish called ‘papa’ and it is the staple food of Lesotho. What can I say about papa? In my previous blogs I had commented somewhat negatively on the fact that for many papa is not only a staple food, it can be the only food people eat all day. Even so when as part of a nutrition class I asked students what foods they liked they all immediately said with enthusiasm, “papa!” “Don’t you eat papa every day?” I asked “yes, we like papa” was the average reply. I was a bit shocked when I had my first Basotho evening meal and everyone was served a pile of papa equal to about 3 of my fists and they downed it! I politely ate a bit and shared the rest, which they accepted with enthusiasm. Well those days are gone, thanks to Ska Mirriam Moteane’s book I am finally cooking papa to addictive perfection, delicate and dumpling-like with a hint of corn. Mmmm, my papa addiction is growing. At a recent community meeting I was shocked to find that like everyone else in the room I ate the entire mound of papa that was served to me, I guess I am now finally culturally integrated. One of the dangers of papa is that it will fill you with almost empty carbohydrates. Fortunately it is often served with moroho (greens, like collard greens a bit bitter unless cooked slowly with seasoning) and sautéed with onions (and occasionally peppers) in oil, with a bit of water and salt. Occasionally a family will serve papa with beans or on a special occasion, papa with greens and meat. The Primary Schools provide a free nutritious meal and often include papa to which they add milk, beans or eggs in order to provide a protein component. So here’s to maize, classified as a vegetable when fresh and as a grain when dried, and to “papa” that ubiquitous food. From field to table to field, feeding a nation.